Esta semana o Milénio Stadium tenta perceber por que caminhos anda a música portuguesa na América do Norte. Trazemos depoimentos, entrevistas, opiniões e testemunhos. Começamos por ouvir três profissionais que, entre outros méritos, têm sabido estabelecer pontes com o resto do mundo lusófono, através da música. Andrew Humphrey, da Arrival Music e David Saraiva e José Xavier, promotores dos conceituados International Portuguese Music Awards. Andrew Humphrey is the General Manager of Arrival Music Group, a boutique record label based in Toronto, Canada. Having over 35 years of experience in the music industry, he has performed on stages such as the Glastonbury Festival and the Monterey Jazz Festival, written and produced top 10 hits in Portugal and has an extensive knowledge of the business of music both in Portugal and Canada. Milénio Stadium: How do you rate the current state of Portuguese music in the Portuguese-Canadian community? Andrew Humphrey: I’d say the Portuguese music scene in Canada is healthy and vibrant, but still in need of further growth. There are, without a doubt, some very talented artists within this community who are making progress in the industry right now. But the real question is how new Portuguese/Canadian artists can find support and means of staying competitive. Some artists are finding creative avenues to expand their audience, like Peter Serrado for example, who is using his Portuguese roots to create promotional avenues both here and in Portugal while delivering content that is commercially viable in a global market. M.S. : Knowing very well the reality of what Portugal is producing in terms of music; do you think the Portuguese-speaking community in Canada has a real knowledge of what Portuguese music industry is today? A.H.: In terms of the music industry in Portugal, the priorities are very different from what is considered viable in Canada. It is typical that new Portuguese artists are developed and promoted with models designed to further these careers within Portugal and rarely do those priorities include an eye toward international markets. As such, a lot of great music doesn’t find it’s way into the ears of the Canadian Portuguese community and the “road map” to expose artists coming up through Portugal to the Portuguese Canadians has yet to be completed. There are outlets here that have vision and are pushing this agenda forward, which is promising, but there is still some work to be done. M.S. : In terms of shows – Do you believe the Portuguese people living in Canada are getting the quality they deserve? A.H.: Absolutely! The promoters here have done a great job of selecting the very best that Portugal has to offer and presenting them with conditions that highlight their performances. 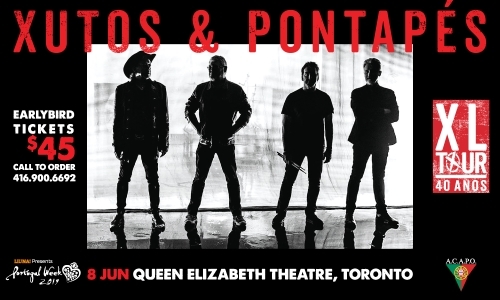 Over the years, legendary bands have made it to these shores and delivered great shows and I am excited to know that Xutos e Pontapés, one of the best rock acts of all time, are coming to the QET this summer. But we also have to recognize that we need more promotional vehicles in order to get the word out and ensure full houses. M.S. : In your perspective, what can be done to improve? A.H.: Ideally we’d have more Portuguese artists gaining traction here in Canada, but it’s really just a supply and demand issue. The fact is that the desire to see Portuguese bands in Canada is very low due to a lack of exposure. This touches on a broader question as to how to create a sustainable market for them. It’s all about promoting them, developing their careers here in parallel with their growth in Portugal. As the quality of artistry grows, I’d like to see industry mechanisms here that could promote these artists, not solely as “Portuguese”, but as viable international stars that can hold their own globally. M.S. : What type of Portuguese music, produced by Luso-Canadians, gets to Portugal? Is there anyone who can cross that bridge – from Canada to Portugal? A.H.: There are very talented Portuguese artists being developed in Canada and the quality of the product is apparent. But it’s important to recognize that these are two independent markets with different approaches to the business. What is considered “right” for Portugal is not always considered “right” for Canada. So the notion of “cross over” success is something that needs to be addressed at the outset of an artists development, including the sound of the music, the look of the artist and even the method of marketing and promoting. It can be done, however, and as I mentioned earlier, with someone like Peter (Serrado) who has an appeal that works in both environments, I think we’ll see more cross-over successes as artists adopt this approach. M.S. : In your understanding, what does the future hold in this matter? A.H.: I think we are on the right path and we are seeing a shift towards further inclusivity between Canadian and Portuguese music markets. I’m hopeful that further development of relationships, both artistic and in business, will provide the bridges necessary to bring these communities together and potentially launch artists internationally from a platform that incorporates the support from both sides of the ocean. It’s about perspective and as we see the distribution of music becoming ever more accessible through digital mediums, the notion of borders is becoming obsolete. We’re already seeing the creation of a “global” approach to artist development with culture and artistic references merging from any and all corners of the globe. I’m excited about these prospects and look forward to a time when Portuguese artists from whatever city or country will find the support and infrastructure to get their music out to a wider audience and find sustained success. As most people are aware, the music business has gone through a transition in terms of how artists earn money. Live concerts are more important than ever in a world where artists no longer make much through album sales. I don’t believe we’re seeing this same live music industry boom however in our Portuguese communities. Many of the organizations (clubs, churches, etc.) that tend to organize feasts are facing challenges due to the aging of their members, coupled with the minimal participation of the younger generation. Also, our Portuguese-American communities are accustomed to seeing live entertainment at events that do not typically charge admission (like feasts, for example). This can lead to promoters having to work harder to fill their seats at events, and can lead them to take greater financial risks when bringing more prominent artists from Portugal for larger shows. The more we can continue to discover and promote Portuguese talent, the better chance we have of exposing and engaging our communities and younger generations to Portuguese arts and culture. At IPMA, we try to cater to a broader audience that is interested in seeing nominees and performers from all different genres of music. That casts a wider net and allows us to appeal to different generations of Portuguese as well as reaching other parts of the Lusophone world. The Portuguese pride that is felt at IPMA is the fuel that motivates the public and our sponsors to continue to support our vision. We strongly encourage Luso artists to continue to make music and call upon our communities to support those artists and help promote our culture going forward. The Portuguese music industry, as a whole, has diminished throughout the years in this part of the world. Popular Portuguese artists in North America have typically catered to the older generation. This most likely led to more performances, but it may have also alienated the younger generation. They did not adapt well with the changes of taste of the younger Portuguese listeners, and hence, a decrease in the participation of that generation in Portuguese cultural events has occurred. IPMA is a neutral platform that can help bridge this gap in the industry. We feel honored in helping make so many connections between Portuguese artists from around the world.